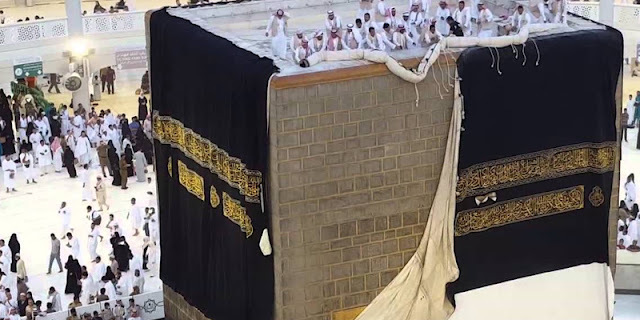 Home / Unlabelled / Why is the Kabah Covered in Black? ‘Al-Bait Al-Ateeq’- another name of the Kabah – which means the ‘The Ancient House’ is visited by Muslims from all over the world for the annual pilgrimage known as Hajj, one of the five pillars of Islam. It is because of the significance of the Ka’bah that great importance is given to the majestic curtain, which covers it. The curtain is known as the ‘Kiswah’. The Kiswah has come from many different places since the Kabah was built. And regardless of the social and economic factors which may have played their roles in this, what has been consistent throughout is that the Kiswah was, and is, considered to be a symbol of reverence and divinity on the ‘Bayt Al-Haram’- another name for the Kabah which means the ‘Sacred House‘. All are parts of expressions of closeness to God. As for the origin of the tradition of the ‘kiswah,’ history offers two options. First that it was Prophet Ismael or one of Prophet Muhammad’s grandfathers, Adnan, who first covered the Kabah. The tradition of covering the Ka’bah is an ancient one since the Ka’bah was for centuries used as an important religious center by more than one polytheistic religion, all of which have now disappeared. Initially the Kabah cover was brought from everywhere and in all colors and types of materials. Covering the Kabah was considered to be an honor and a privilege; thus there was much competition between important families and groups to do so. Tribes from the Arabian Gulf as well as other parts of the Middle East collaborated to ensure that the Kabah was never uncovered. Different materials from different parts of the world were brought to cover it. During the Prophet Muhammad’s time, the Kiswah was made of cloth from Yemen and it was changed and renewed twice a year – before Ramadan and then during Hajj. Later during the reign of the Caliphs, providing the Kiswah was formally undertaken as part of state or ‘governmental’ obligation. At that time, Egypt whose people were famous for their intricate weaving of complex designs in all sorts of materials became responsible for supplying the Kiswah. During the Ottoman Empire, great care was taken in selecting the best embroiders and weavers in Tinees, an Egyptian city famous for its facility and excellence in design. In those days, the Kiswah was made of black silk on which were various complex designs and embroidery. The Kiswah has remained black since then and it is still black today. In the earliest days, the Kiswah was never removed from the Kabah, the new one was simply draped over the old. In the year 160 H, Al-Mahdi Al-Abbasi ordered that the Kiswah be limited to a single layer due to fears that over time the cloth might actually damage the Kabah. From that time, the Kiswah was always one layer with used ones being bestowed as gifts in carefully cut and framed squares. When King Abdul Aziz entered Makkah in 1343 H, he accepted full and total responsibility for the Kabah which included providing the Kiswah. The actual ‘kiswa’ is in three main parts: the Sitaar (curtain) of the Kabah door, the inner-lining curtain inside the Kabah and the ‘Hizam’ (the belt) of the Kabah. All are made in an exclusive and specialized Kabah Kiswah Factory where the most accurate and skillful levels of production are employed whether in the actual material from which the Kiswah is made or the embroidery that is used on it. The Sitaar, 6.5 meters high and 3.5 meters wide is made of black silk with a thick green silk lining. Verses from the Quran are written on it and Islamic designs are prominently embroidered upon it and all are covered in silver wiring plated with gold. The curtain lining the inside of the Kabah is hand-woven and thus calls for accuracy and skill as well as genuine artistry. Its making consists of several phases beginning with dyeing the silk green. Verses and designs are drawn and printed onto the green silk for the embroidery that is to follow. Among the most delicate and longest processes is the embroidery, which is stitched in white over the intricate designs and printed verses. The green silk is then spread and draped over the inner walls of the Kabah as well as on its ceiling. This part of the inner lining is changed every 3 to 5 years. The third main part of the Kiswah is the ‘Hizam’ or the belt of the Kabah. It is an exquisite work of art. Placed two-thirds of the way between the ground and the top of the Ka’bah, the Hizam crowns the Ka’bah with golden beauty and radiance. The ‘Hizam’ is a belt woven of verses and Islamic designs embroidered in thick silver wiring, densely coated in gold. It is 47 meters in length and 95 cm wide. Because of the spiritual significance of the Kabah, an official ‘kiswah’ factory was established during the reign of King Abdul Aziz in 1346H with Sheikh Abdul Rahman Muzhar as its first manager. The factory produced its first ‘kiswah’ that same year and the work was later expanded from three sections into a total of six. Making the Kiswah is divided into five stages. First there is the dyeing phase which begins with the raw silk material soaked and bathed in hot water mixed for 24 hours with soap as well as other elements. The silk then turns a dazzling white and is then dyed black or green depending on which part of the Kiswah it is for. Any threads to be used for lining are also dyed in the appropriate color. Then there is the second stage which is weaving. Previously most of the weaving was done by hand; however, for the larger parts of the Kiswah which do not require great artistic delicacy, the weaving is done mechanically. Hand-weaving is still used for the final touches that can only be added by human artistic touch. The next phase is the printing of all designs and calligraphy that will be placed on the ‘Hizam’ or on parts of the Kiswah which are embroidered. The fourth phase is the actual embroidery and it is the longest and most strenuous stage. All the designs and calligraphy are embroidered by hand in silver and gold wiring. The verses and designs are filled with cotton stuffing and then covered in cotton threads of yellow and white in adjacent positions. Then it is covered in golden silver wired embroidery which protrudes from the Kiswah up to 2 centimeters which is why this process cannot be mechanically done. The final phase is the preparation process for dressing the Kabah, which involves coordinating and locating the corners of the Kiswah so that the proper designs and verses can be displayed in their specified places. Additional lining may be added to some areas. For Muslims there are two ‘Eids’- two special days which are celebrated. One is at the end of Ramadan, the month of fasting, and the second one is at the end of Hajj, the pilgrimage. And each year by the 9th day of Dul Hijjah, the month of Haj, the new Kiswah is ready and prepared to dress the Kabah.